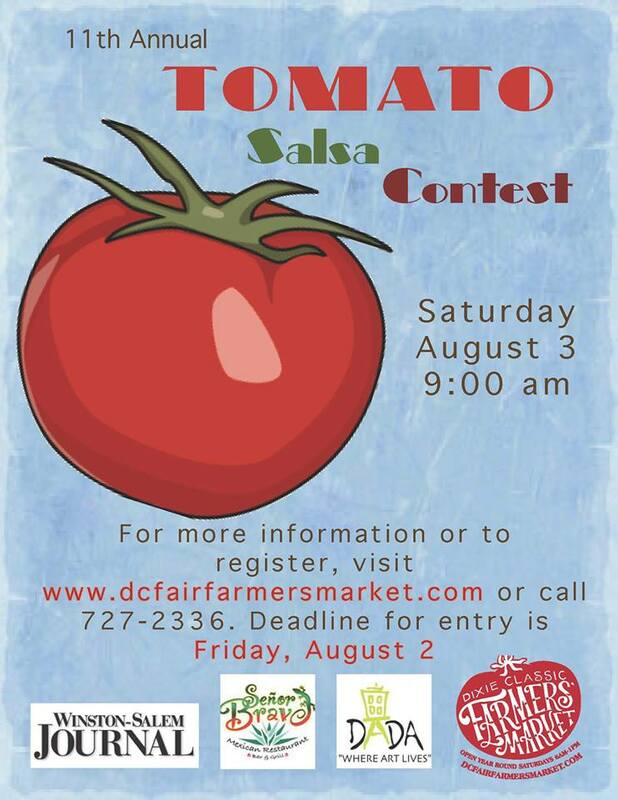 I entered the 11th Annual Tomato Salsa Contest at the Dixie Classic Farmer's Market on August 3. I did not win, but I still had fun all the same. I did not pay attention to the winners, but one of the top three winners was a berry-pomegranate salsa that definitely deserved to win. It was delicious. The recipes will be published in the Winston-Salem Journal next week. I'm publishing my own recipe now. Coming off a win of speed and diligence to shuck corn faster than the mayor, I thought I'd enter the contest to see if my winning streak would continue. I am not really a salsa maker. I make an excellent pineapple-corn salsa, but this was a tomato salsa contest. 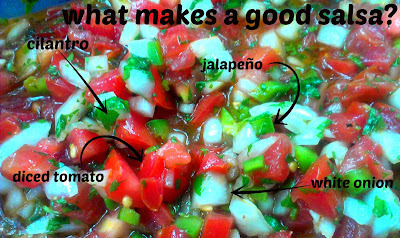 What I learned today: Pico de gallo is made up of fresh raw tomatoes, onions, jalapenos and cilantro chopped up into tiny chunks and served cold or room temp, sometimes marinated in an acid like lime juice or vinegar. My "salsa" was more of a pico than a salsa. I chopped all of the ingredients by hand. I was proud of my knife work. I had my favorite knife sharpened by Peter of Sharp Edge. I was on a roll. Or so I thought. Salsa contains similar ingredients to pico de gallo, (often with the addition of garlic) and is always in a more liquid state. Some versions are strained and have no solids at all; some versions are slightly chunky, but all always more liquid than solid. If I'd used a food processor or blender, I may have faired better. Oh, and used more jalapeno seeds to make it spicier. I didn't want to kill anyone with heat. Next time, I'm putting up the furnace to full blast. Pulse all of the ingredients, except for the tomatoes in a food processor until chunky. 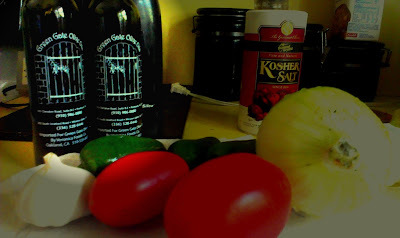 Pour processor contents into a bowl and add tomatoes. Season with salt. To modify the heat, add another tomato, use more jalapeño peppers and/or keep some of the chile's seeds. Sounds tasty! I love a nice chunky salsa fresca. I don't put oil in mine and use fresh lime juice instead of vinegar, but otherwise, your ingredients are pretty close to what I have always used. What a fun contest! Thank you, Kelly! I usually never put oil or vinegar, but I wanted to try it to see what was going to happen. It turned out great. The longer it sits, the better it tastes.